Talk about serendipity. Nothing about this picture was planned at all, and yet I’m pretty happy with how it turned out. It came about when a coworker and I went on a short walk to the campus post office a few weeks ago, and as we were heading back to the office we spotted this rather unique car in the parking lot. It’s a Tesla Model S, and though I had read about them and seen videos online I never got to see one in person. And as luck would have it, I had my D200 + 50mm combination with me (yet another reason to always have your camera handy!) so we paused for a few minutes to gawk at the car and take a few pictures. A bit about the photo: I shot it at f/9.5 so I could reign in the depth of field just a bit while also hopefully getting a bit of sun flare that would likely get all blown out with a larger aperture. I used ISO 100 to get as clean of a shot as possible, shot in Aperture Priority, and ended up with a 1/160 shutter. I shot from a low angle to accentuate the sleekness of the vehicle and hopefully convey a sense of power and dominance, which would be kind of lost if it were shot from eye level. My GF is the one in our relationship that likes to do the abstract shots, as for me I wouldn’t pass up the opportunity of shooting the entire car. Wow! I’ve only seen the Tesla in my dreams. Let us know when you get to have a ride. My dream job has always been to be a test driver for new cars! I did get a ride a few days later and…not gonna lie Coralana, it was really really cool :) I hope you get to ride in one and someday maybe even get that dream job of yours! Interesting. I agree that your photographic prowess has improved since last fall with the VW picture. ..keep up the good work. Surprise shot from you this week. No people — No animal. 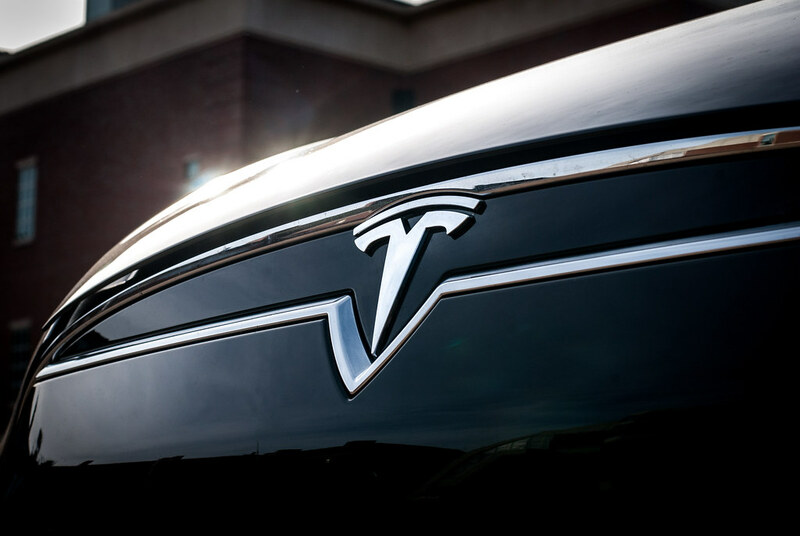 Yet the logo of the Tesla is the center of attention for the photo. Nice job of capturing the light shining off of the waxed finish; the reflection in the front bumper; and, the Tesla logo facing off to that portion of the photo where the car is facing. You are so right. You can’t take photos unless you have your camera! Thank you, Simon. Thank you David :) It’s certainly a different style of picture than what I’m used to taking, but trying new things is all part of the fun of photography!